Meeting Stephanie Garber, Nic Stone, Samira Ahmed, Anna-Marie McLemore, Katie Locke, Ash Poston, Leigh Bardugo, Daniel Handler, Jason Reynolds, Cassie McGinty, Janine Perez, Chelsea Fought, and accidentally stalking Chad Michael Murray. Meeting up with Shae, Brittany, and Melissa. 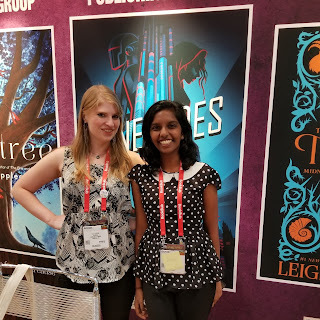 The Macmillan publicist telling us that the drop for The Hazel Wood wasn't for another hour and then looking really confused when we said, "We know." Nic Stone finding out I almost have a Ph.D. and saying "Damn, girl!" Nic putting Joey's business card in her headband for all the rest of her signing photos and breaking Joey. 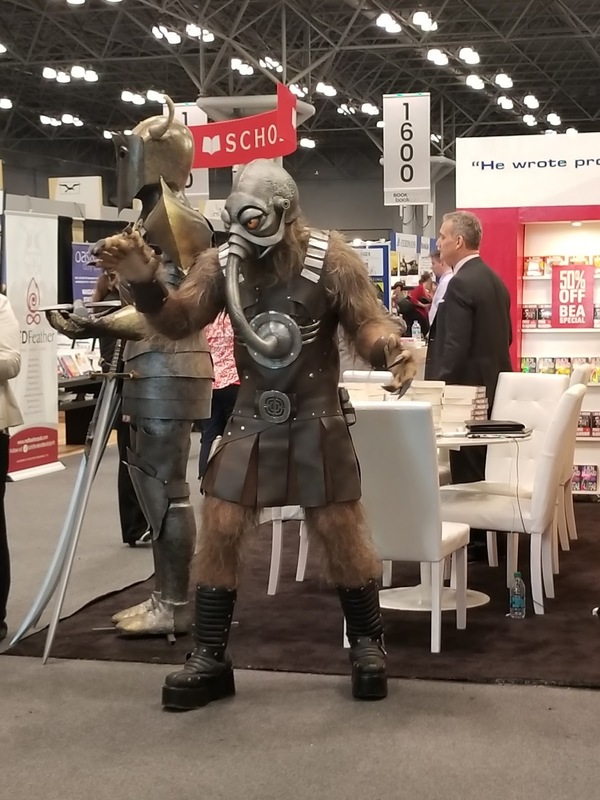 Publishing gossip. Shhh, don't tell. Joey still having trouble recognizing when I'm being sarcastic (which is almost always). No tickets to line up for today, so it was actually a pretty chill morning. The only thing I super wanted right away was Odd and True by Cat Winters, who is one of my favorites, and the special gift from The Golden Compass by Phillip Pullman, which turned out to be a special paperback of the first book and a beautiful Litographs art print. Can I tell you how much I'm dying for The Book of Dust? There are things that need to happen. Hem. We finally got coffee! Seriously, we almost weren't going to and I thought I was going to die. This was also the day that we only had breakfast, aka Joey had a wrap and I had a granola bar, string cheese, and one of those little smoothie things that comes in a pouch. Went to the line for DANIEL HANDLER YES THAT'S RIGHT LEMONY SNICKET. Told him how much I loved A Series of Unfortunate Events and how I read them all when they first came out. His reply: "Oh dear, I'm sorry. I wish I had been there to prevent that." He's seriously delightful. I woefully regret not getting a picture. 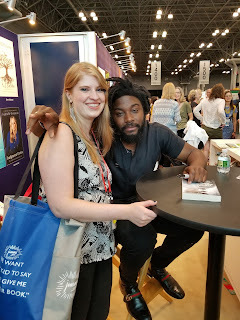 I met up with Joey, Shelley, and co in the signing line for Jason Reynolds! I'm super intrigued by the premise for LONG WAY DOWN and Jason is a legit rock star, so I was going to be super sad if I didn't get to meet him. It all worked out! They gave out cute enamel pins and Jason is pretty much the embodiment of chill. I had absolutely nothing clever or interesting to say to him because I was sort of overawed by the majestic serenity o f his presence. Aka I was super freaking awkward. Immediately after was the rush to Nic Stone's line for DEAR MARTIN! Another hotly anticipated debut. 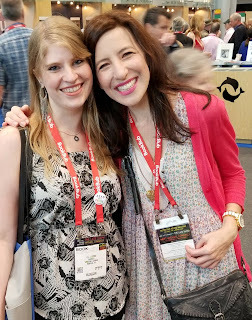 While we waited, Mishma ran into Stephanie Garber and I was really high on coffee at this point, so I just had to run to say hi. She's so sweet!!! When she saw my name she remembered me and gave me a huge hug, and I had one of those OMG A FAMOUS PERSON KNOWS MY NAME moments. But hopefully I didn't fangirl too much until after. 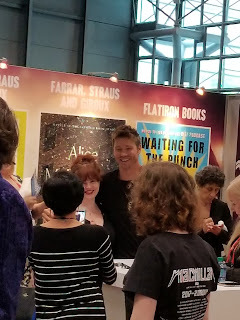 Then back to Nic's signing! I'm not even sure how to describe how awesome she is. She and Joey talk a lot, so she was super excited to see him and she asked him for a card and stuck it in her headband. Oh, yeah. She was wearing a unicorn horn. "Because I'm a goddamn unicorn." She is incredibly self-assured and smart and her makeup is, as her twitter would suggest, SO on point. If she ever read this she'd probably think I was a crazy fangirl, but she's just so cool! I'm pretty sure she also has some magical aura because this is probably the best non-candid photo I've ever taken. Didn't get a copy of Moxie by Jennifer Mathieu. Major regret. Stopped by The Wall to catch up with the most lovely Shae (@shaelyncherie). The Wall being a cute promo for Signs of Hope, a book with pictures of the post-election installation art of hopeful postcards in the NYC subways. 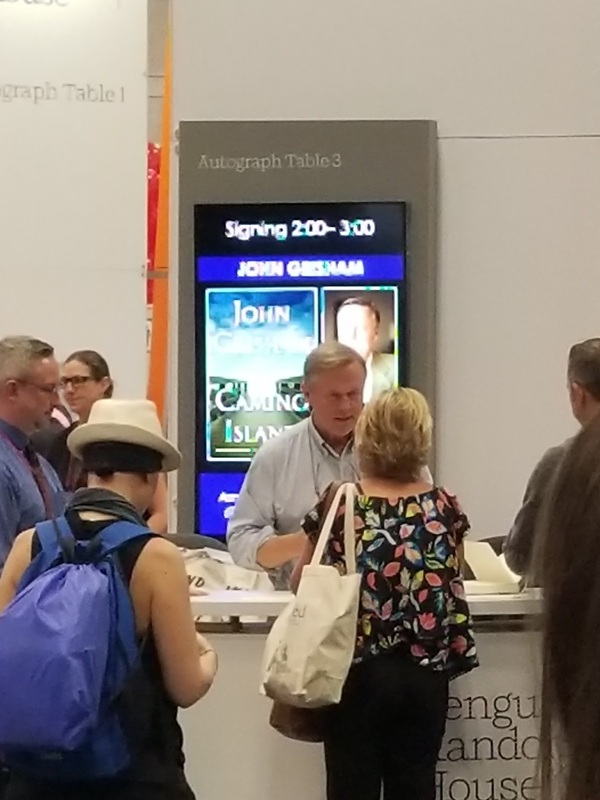 The author or whatever was pretty cool. Except I laughed because he said he was dressed like he thought a psychologist would dress, and I was like, "About that..."
Popped over to Entangled for Tristina Wright's signing of 27 Hours. Her hair matches her book. Seriously. Sort of ditched the schedule for a while. I was so tired! Just went around to a bunch of publishers to say hello, attempt to "network." Ended up finally meeting Cassie McGinty from Disney in person. She's just as sweet as she is online! She also convinced me to grab Rosemarked, which is apparently amazing. Go check it out. Disney was doing their supersecret signings, as usual. They had the galleys under a tarp! 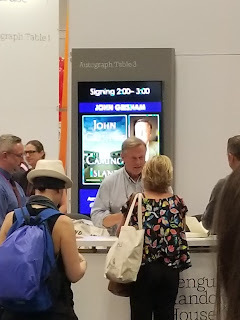 Also saw John Grisham. 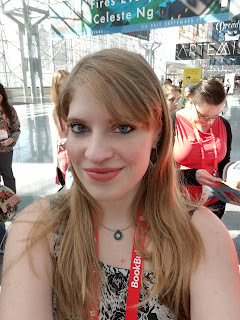 Had a random meetup with Shelly, Mishma, Katie Locke, Anna-Marie McLemore, Ash Poston, and Vee. Totally didn't act like a weirdo (can you sense the sarcasm?). Mish and I striking superhero poses to get Renegade slap bracelets! Mishma: "Can smiling be my super power?" Publicist: "Yeah, sure." Oh hey, Chad Michael Murray. Joey and I ran into him earlier, before this photo (almost literally). We saw him as we were lost, trying to find the Wild Beauty line, and then I did a double take. Then we ended up having to turn around so he probably thought we were following him. Oops. Hovered around Macmillan to get The Tiger's Daughter by K. Arsenault Rivera, which I had just heard about before BEA but which is all over twitter now. It's Chinese-inspired fantasy for adults and I can't wait to dig into it. It's pretty huge. Somewhere in here, Shelly and I went to say hello to Leigh. Leigh and I chatted for a bit and she is really so sweet. Plus she looked like a dramatic dark witchy goddess. I'd show you, but the picture didn't take for some reason and I am completely bereft. Have this alien we saw instead. 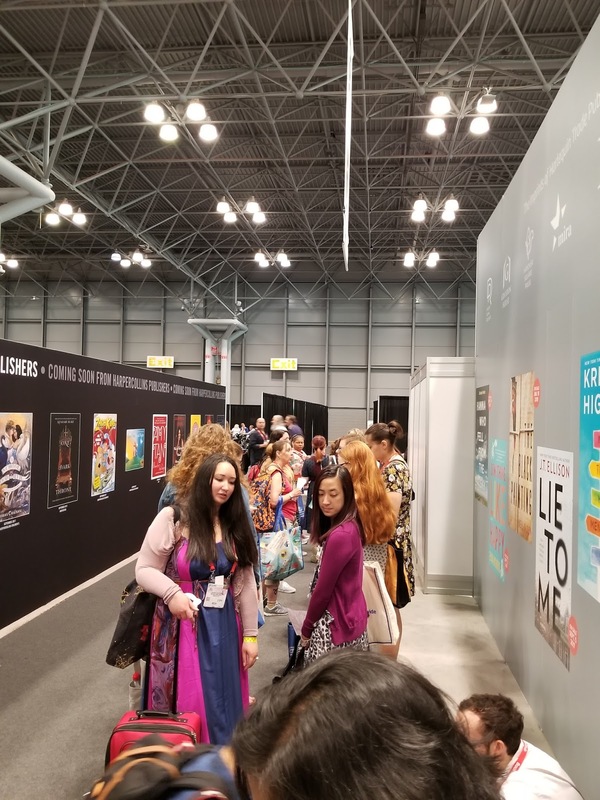 The signing line for Forest of a Thousand Lanterns was so long that we couldn't find the end. Julie is such a rock star! Last big thing of the day. 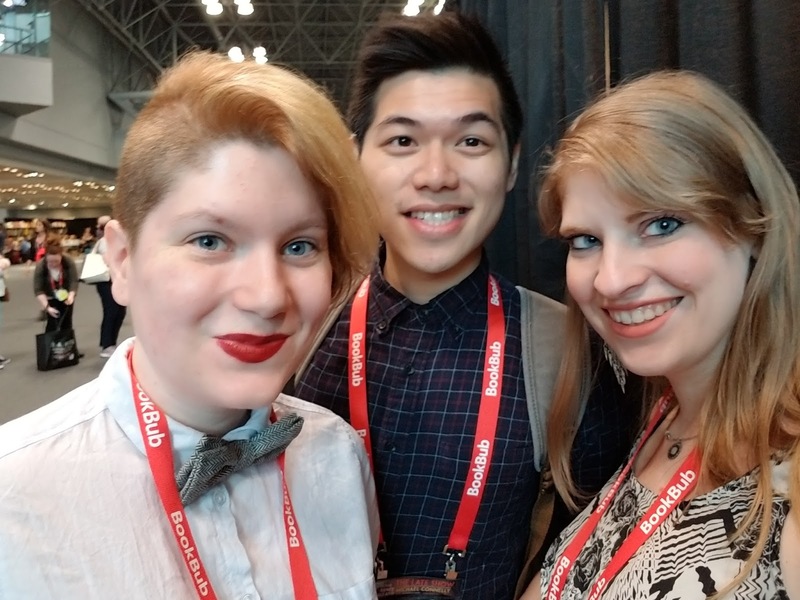 We were really tired, so we lined up almost an hour early for the drop of The Hazel Wood by Melissa Albert at Macmillan. We accumulated so many other people that Macmillan had to bunk tradition and create an actual official line. 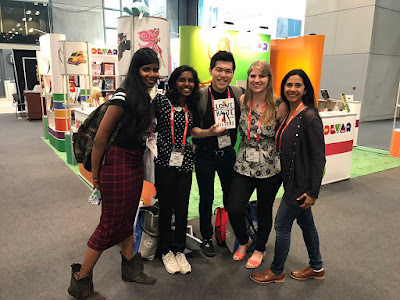 Not only was it a nice break, but Chelsea Fought from Penguin came to say hello, and introduced us to Janine Perez, who runs Riveted for Simon. 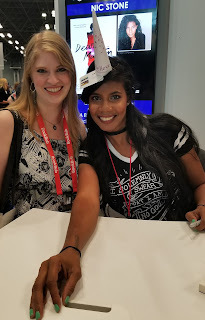 She was utterly delightful and after she and Mish fangirled about When Dimple Met Rishi for a while, we fangirled about a few other books we were all dying for. Then we got The Hazel Wood! Then we skipped back to S&S so she could show us This Mortal Coil, which she totally sold me on because it has the most amazing presence. Aka, future technology, where people can hack your brain implants. Somehow the day was done! We did, however, run into Nic Stone and Samira Ahmed, whom we chatted with for a while. Samira showed us this adorable photo album Eric Smith had made her of people at BEA the literal day before holding her book. Nic continued to be badass and told us how she had a lipstick flask and was on track to be a neuropsychologist before she landed her book deal. I got so sidetracked talking to them that I almost forgot to go to the shipping room to mail my books! Of course there were like a thousand people there. They gave us dollies, thankfully, and slotted us into lines. 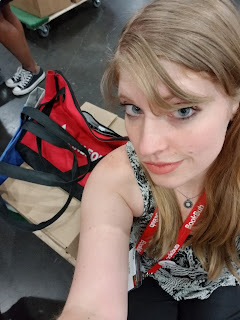 I lazily and creatively sat on my dolly next to my box and wheeled myself along whenever the line moved. Which was almost never, because the two women in front of me had NINE 30+ pound boxes and took FOREVER. Then the BEA part was officially over! Sad. After a series of comical navigational errors and attempts to reach Mishma through Brittany's twitter, me, Vee, Shelly, Joey, Hazel, and their friend Michael went to this place that sounded like sort of boring bar food but was actually totally delicious. We explained to Shelly what aioli was. She got avocado aioli, which we decided was the whitest aioli. Which is already pretty white. Then Mish and Cale were coming, then Mish was coming, then Mish and Cale were coming, then neither of them were coming, and then Mish got lost on the subway and we ran to Penn Station to walk back Vee and Michael and ended up luckily retrieving her. We spent a delightful night (last night with the roomies, whimper) plotting a YA romance about The Ugly Brother based on the third Hemsworth (look him up). I haven't laughed so hard in ages.